How we developed this animation workshop: Our challenge was to come up with something that would allow people to experiment and have fun within a short time frame, but still wind up with some sort of coherent end product. Thinking about past examples of this sort of undertaking, the animated MTV logo came to mind. Throughout the 1980s and 90s, a dense roster of animators and filmmakers created 30-second promotional bumpers for the network, using a countless variety of approaches and techniques, all riffing off of and landing on the iconic MTV logo at the end of each visual romp. Taking inspiration from this era of experimental popular culture, we thought it would be fun to have workshop participants remix the 10-second TED intro title sequence animation, using a variety of materials and frame-by-frame animation techniques on tabletop stop-motion setups. And in order to maximize the time we had with people, many of whom likely had very little prior experience with animation, we decided to have them rotoscope the TED intro. For our purposes, we had the TED intro sequence pre-loaded into the stop-motion software we were using to capture frames. This enabled us to superimpose the sequence over the camera feed on the screen as participants animated, so they could visually refer to it frame-by-frame as they went. We prepared a short reel of examples of work created with the techniques and materials we were about to employ, and then turned our participants loose, encouraging them to experiment and diverge from the reference material if they so desired. You will also need a tripod to stabilize your camera. Any tripod will do. Here are two lightweight, very reasonably priced options available on Amazon and elsewhere: Sony VCT-R100 / Magnus PV-3400. Of course, the heavier duty the tripod, the more stable your set-up will be! Check the specs to be sure that the tripod you choose can support the weight of your camera. 3. Use your digital camera to take photographs and edit them together later. Animation is simply a sequence of photos, so it’s not necessary to purchase a tablet or software in order to make animation, if you have access to video editing software. As long as you have a tripod to stabilize your camera, and the patience to edit the photos into a sequence, you can always make animation this way! To learn more, watch TED-Ed’s series of videos on ed.ted.com called ‘Animation Basics’. Some of these are behind the scenes on our animated lessons, and others are meant for first time animators. All of them are filled with animation #protips! 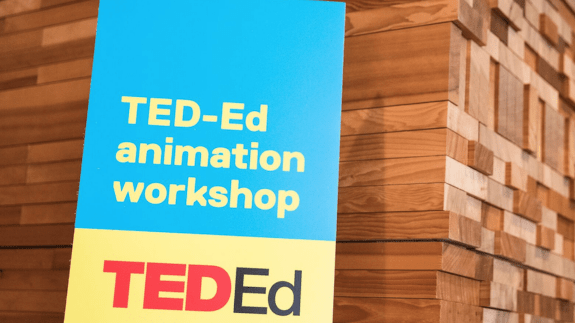 We especially recommend: TED-Ed animators explain timing and spacing, and TED-Ed animators explain how to make pixilation animation, or ‘homemade special effects’. Happy animating!